A couple of the best players in the NHL were feeling strong and violent on Thursday night: While Connor McDavid and Alex Ovechkin each netted a pair of goals in their teams’ wins, they also showed up to the rink ready and willing to dish out more visceral pain. The desperation of the middling Oilers was palpable in what would be a 4-3 shootout win against the Florida Panthers. Both McDavid and Draisaitl had over 27 minutes of ice time, and even then it wasn’t until eight seconds remained in regulation that McDavid tapped in the game-tying goal. 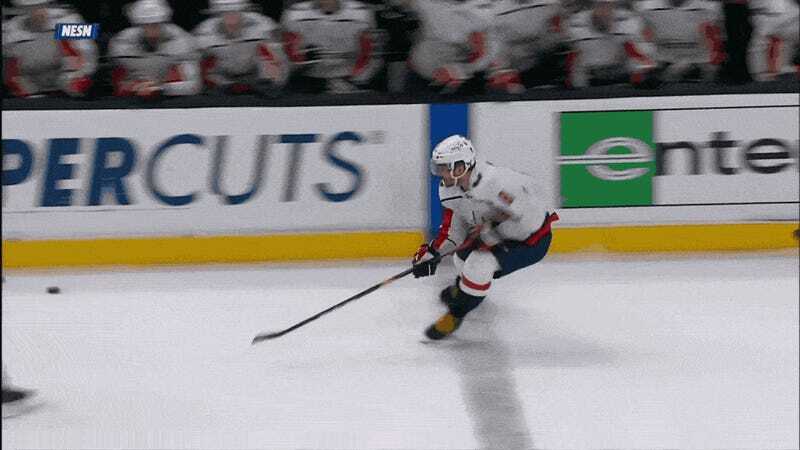 Earlier in the game, however, a different, wilder beast within McDavid came out to play, as the superstar lined up an oblivious Aaron Ekblad and mushed him with a check to the shoulder. It’s not that McDavid always avoids contact. But heading into last night, McDavid was dead last among full-time Oilers players with just 15 hits this year (and the NHL is quite generous when it comes to doling out credit for checks). While it’s a solid play from Ekblad to keep the puck in the attacking zone, it’s also good to see the kid with the target on his back show some initiative in protecting himself. Much more iconic than that small attempt at destruction, however, was Alex Ovechkin’s slaying of Boston’s giant in the Capitals’ 4-2 win against the Bruins. It was the first rematch between the teams since a chippy season opener, and although Brad Marchand ducked a fight with Lars Eller and Tom Wilson’s contributions were more verbal than physical, it was the league’s leading scorer who made the statement by forcing the 6-foot-9 Zdeno Chara over the boards onto the Washington bench.